Jo Hovind & Her Daughter Marlissa – November 13, 2016 – Kent Hovind v. Robert Baty – The Great Debates! Jo Hovind is the woman Kent Hovind sent to prison rather than accepting responsibility for his decades long criminal career and protecting her from the consequences of his bad acts. 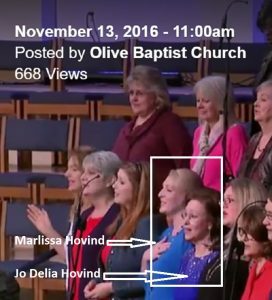 Marlissa Hovind is one of their three children. 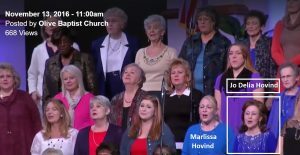 Today, November 13, 2016, they were in church together, singing in the “choir”.